Today sees the individual re-issue in paperback and eBook format of the first four of Desmond Bagley’s novels: The Golden Keel; High Citadel; Wyatt’s Hurricane; and Landslide, with The Golden Keel also being available as an unabridged audio book. To celebrate the first four re-issues, The Bagley Brief was fortunate to have an opportunity to interview the author Peter James, for whom Bagley was an inspiration. Peter James is one of the UK’s most treasured crime and thriller novelists. His Roy Grace detective novels have sold over 18 million copies worldwide in total. The series is now translated into 37 languages and have achieved 11 consecutive Sunday Times No 1s. Peter has been two-times Chair of the Crime Writers’ Association and has won many literary awards, including the publicly voted ITV3 Crime Thriller Awards People’s Bestseller Dagger and he was shortlisted for the Wellcome Trust Book Prize. As popular internationally as in the UK, he won the US Barry Award, for Best British Crime Novel in 2012 and in 2015 Peter was voted by WH Smith readers as The Best Crime Author Of All Time. His latest Roy Grace novel, Love You Dead was published May 2016. The Bagley Brief: You mentioned recently that Desmond Bagley’s novel Running Blind was one of the first thrillers to have made a great impression on you. I wonder when it was that you first read this novel and in what way the novel captivated you? Peter James: I read it when I was living in Toronto in about 1973. It blew me away and I still think it has one of the most captivating first two paragraphs I’ve ever read. I often quote it is a terrific example of how to hook a reader on the first page. TBB: Was Running Blind your introduction to Bagley’s novels, or had you read others? PJ: It was my introduction to him. It made me want to read more of his work, instantly. No, I’d get bored. The whole point is that if you have a series character like Hamilton’s Matt Helm, pretty soon you can’t distinguish one novel from another. Your central character becomes rather frozen and fossilised into certain attitudes. I’d rather have a different character each time. If any one of my characters appears in more than one novel, they usually tend to be my villains rather than my heroes. You have, very successfully, managed to create and maintain a plausible series character in Detective Superintendent Roy Grace, how much of a challenge is it to not fall into the trap that Bagley describes? PJ: I think this is such a personal choice for writers. But what I would say from experience of having written some thirteen stand-alones before I created the Roy Grace series is two things: Firstly the most important thing in writing – and the hardest to create – are great, engaging characters. And if you make them real enough you can move them forward in their lives – I love doing this with Roy Grace! Secondly many writers have pretty much made a career out of a single character – Ian Rankin with Rebus, Lee Child with Reacher. Conan Doyle, too – much though he tried to move on from Holmes he couldn’t create anyone with the same mass appeal and had to bring him back. The great thing about a successful series characters is it means you have a built-in following for each new book – provided you keep raising the bar and moving your character forward. The Detection Club is a private association of writers of detective fiction in Great Britain, existing chiefly for the purpose of eating dinners together at suitable intervals and of talking illimitable shop … Its membership is confined to those who have written genuine detective stories (not adventure tales or ‘thrillers’) and election is secured by a vote of the club on recommendation by two or more members, and involves the undertaking of an oath. I know you have read Bagley’s short crime story ‘A Matter of Months’, originally published within Winter’s Crimes 8 in 1977 , and I’m interested to know your thoughts on the structure of this story and what you make of the characters Detective Inspector Howell and Sergeant Parker. PJ: I hate to say this but I was surprised and a little disappointed with this story. What I loved about Bagley’s novels was the energy and excitement of them. Here he seems to turn to a very old-fashioned whodunnit style – if you hadn’t told me it was written by Bagley I would never have guessed. I don’t feel either Howell or Parker is very well drawn, so I have little sense of them. And I really felt the ending was lame and unsatisfying. Sorry, but I found myself forcing myself to turn the pages, rather than wanting to…. Crime writers are often accused of adding to the violence of the world by depicting it. The truth is that we just hold up a mirror to the world and reflect but a pale image of reality. Truth is stranger than fiction. PJ: Absolutely. All you need to is look back at the history of man’s inhumanity to man. Or the recent past of some of our most monstrous serial killers, like Brady and Hindley, Dennis Rader, Ted Bundy, Fred & Rose West. Crime writers to a very very large extent are informed by criminals rather than the reverse. TBB: If you were to re-read one of Bagley’s novels, which one would you pick up first. Would it be Running Blind, or do you have another Bagley favourite? PJ: It would be Running Blind because I always felt that book had a magic about it. Flyaway would be a very close second, the atmosphere of that book stayed with me for years. TBB: In 1994 Penguin published your novel, Host, on two floppy discs, bound inside a hard cover advertising it as ‘the world’s first electronic novel’ earning it a place in the Science Museum collection as one of the earliest examples of the form. Along with this accolade and your obvious love of technology I have no doubt that you and Bagley would have found much to talk about. PJ: Yes, I think we would have had much to talk about! I felt his writing was very cutting edge and was cut tragically short at only 59. I think he would have loved today’s advances in technology and many would have featured strongly in his work. TBB: A final thought as we enter 2017, which sees the individual re-issue of all of Bagley’s novels. PJ: I was very sad when I heard Desmond Bagley had died, as he was such an inspiration to me and such a very good writer. I am so happy he is once more to have a day in the sun, and I shall avidly re-read some of his titles. 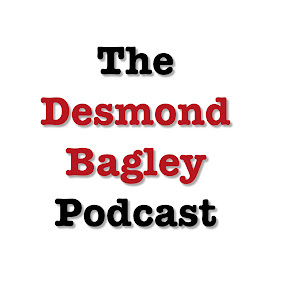 My thanks to Peter for taking the time to share some thoughts on Desmond Bagley. For those readers not yet familiar with the work of Peter James you can find out more about him at www.panmacmillan.com and Peter’s website www.peterjames.com or follow him on social media here: Facebook; Twitter; Instagram; YouTube Channel. Running Blind is due for individual re-issue on 20th April this year, with Flyaway being available on 13th July. Click the titles for pre-order links. Bagley’s short crime story ‘A Matter of Months’, was republished in 2009 under the Harper imprint as bonus material in the ‘2 in 1 Double Action Thrillers’ edition of Running Blind & The Freedom Trap, click the titles for details. Bagley’s ‘Introduction’ to the Crime Wave anthology was also republished in 2009 under the Harper imprint as bonus material in the ‘2 in 1 Double Action Thrillers’ edition of Wyatt’s Hurricane & Bahama Crisis, click the titles for details. Images © 1974 Allen J. Hubin [The Armchair Detective cover artwork by William Dixon], © Pan Macmillan Publishing [Winter’s Crimes 8], © HarperCollins Publishers Ltd. [Crime Wave]. 1. ‘A word with Desmond Bagley’ by Deryck Harvey The Armchair Detective (Minnesota: Allen J. Hubin, 1974), Volume 7, No. 4, August 1974 pp. 258 – 260. 2. Edwards, M. (2016). pers. comm 28th July 2016. 3. ‘A Matter of Months’ in Winter’s Crimes 8, edited by Hilary Watson (London: Macmillan, 1976), pp. 9-35. Republished as bonus material in Running Blind & The Freedom Trap (London: Harper, 2009). 4. ‘Introduction’ to Crime Wave, edited by John Wynne (London: Collins, 1981; New York: Riverrun, 1981). Republished as bonus material in Wyatt’s Hurricane & Bahama Crisis (London: Harper, 2009).